Suicide on the increase. A pathetic story of a boy hanged himself in his bedroom when he feared he would get a ‘red’ mark against his name for forgetting to take his satchel to school. Teenage boy, Tyrese Glasgow, 12, returned to his home in Mossley, Greater Manchester, after realising on the school run that he did not have his text books with him. But when he got back home, Tyrese – who ‘hated getting into trouble -discovered he had misplaced his door key and was unable to get into the property. When he eventually got into the house, Tyrese ran upstairs into his bedroom. When he did not turn up for lessons, the school rang his mother, who found her son hanging from his bedroom door. 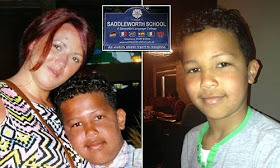 Before his death, Tyrese had been awarded ‘star of the term’ award at the 1,300 pupil Saddleworth School in Oldham. The teenager had also been given high ‘green’ grades by teachers under a scheme for good behaviour. But, at an inquest into his death, his mother Katy Cross, 32, said the youngster feared he would be given a ‘red’ mark for arriving at school without his bag. Miss Cross, who was dropping her son off at school when he realised he had forgotten his things, told the Stockport hearing: ‘I told him to go and get it and come back straight away and go back to school. ‘It would have taken him ten to 14 minutes and, if he had done exactly that, he would have been on time. Miss Cross added that she thought her son had a door key, but that the school later contacted her at work to say Tyrese had not showed up. ‘I started ringing him and messaging him and I thought he was just ignoring me because he had been caught out,’ she said. I spoke to my partner Brian and asked him to go home to check on Tyrese. When I got home, I shouted him and there was no answer. Miss Cross and her partner tried to revive Tyrese but he was pronounced dead in Tameside Hospital. A post mortem examination confirmed he died from asphyxiation. The teenager missing front door key was later discovered under the handbrake of her car.